Griffin apologized for the grisly photo that showed her holding Trump's blood-covered head, saying: "I beg for your forgiveness." Kathy Griffin apologized for the picture in which she was seen holding a prop of Trump's bloody. 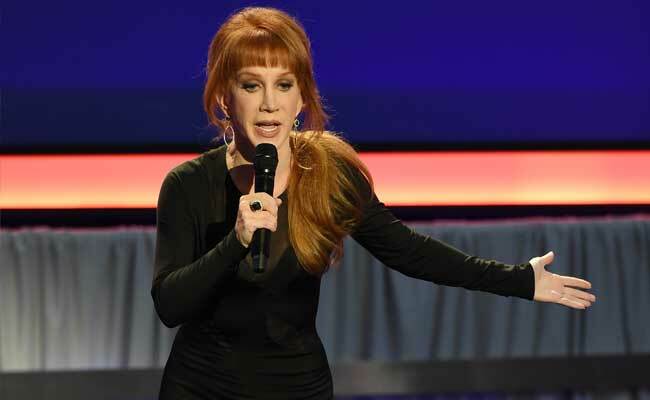 Kathy Griffin continues to drown in backlash over a gruesome photo shoot that enraged President Donald Trump, drew widespread bipartisan criticism and has now cost Griffin her longtime New Year's Eve co-host job with CNN. Griffin's firing by CNN came hours after she apologized for the shocking picture in which she was seen holding a prop of Trump's bloody, severed head. In a video posted on social media, Griffin said she crossed the line and that the image was too disturbing. "I sincerely apologize. I am just now seeing the reaction of these images," the 56-year-old comedian and reality TV star said of the picture. The president tweeted Wednesday morning to attack Griffin over the widely denounced image, which Trump called "sick!" "Kathy Griffin should be ashamed of herself. My children, especially my 11 year old son, Barron, are having a hard time with this. Sick!" CNN, where Griffin has co-hosted a New Year's Eve program since 2007, initially called the picture "disgusting and offensive." Her New Year's Eve co-host, Anderson Cooper, tweeted that he was "appalled by the photo shoot." On Wednesday afternoon, CNN said it has terminated its agreement with Griffin. Multiple members of the Trump family have spoken out against Griffin. In a statement, first lady Melania Trump said that "as a mother, a wife, and a human being, that photo is very disturbing. When you consider some of the atrocities happening in the world today, a photo opportunity like this is simply wrong and makes you wonder about the mental health of the person who did it." Donald Trump Jr. was especially incensed, tweeting the photo was "disgusting but not surprising." Griffin, a veteran stand-up comedian and actress who has won two Emmys for her reality show "My Life on the D List," had shared the image in a now-deleted tweet. "I caption this 'there was blood coming out of his eyes, blood coming out of his . . . wherever,'" she wrote Tuesday. In a second tweet, she added: "OBVIOUSLY, I do not condone ANY violence by my fans or others to anyone, ever! I'm merely mocking the Mocker in Chief." The photo was shot by Tyler Shields, whose own biography notes that he is "recognized as 'Hollywood's favorite photographer,'" having evolved from the "'bad boy of photography,' with his controversial bloodstained photographic series featuring Lindsay Lohan." Griffin said Tuesday night that she has asked Shields to take down the image. Criticism came from liberals and conservatives, including former GOP presidential nominee Mitt Romney and Chelsea Clinton. Clinton called the photo "vile and wrong." Responding to a comment that "it's also 'art', it doesn't hurt anyone," Clinton said of Griffin and her gory photo: "I can both respect her right to freedom of speech, which I do, and think it's not funny and not ok."
Another company also distanced itself from Griffin: The Utah-based producer of Squatty Potty toilet stools and Unicorn Gold bathroom products said it was suspending a new ad campaign starring the comedian. "We were shocked and disappointed to learn about the image Ms. Griffin shared today," Squatty Potty chief executive Bobby Edwards said in a statement. "It was deeply inappropriate and runs contrary to the core values our company stands for. In response, Squatty Potty has suspended its ad campaign featuring Ms. Griffin. We have acted swiftly and decisively to demonstrate our commitment to a culture of decency, civility, and tolerance." Griffin has been critical of Trump in the past. Speaking with MSNBC's Chris Matthews about Trump's first address to a joint session of Congress, she said "he just says one hateful thing after the other. He's so embarrassing." On "The View," she called Trump "insufferable." In an interview with Entertainment Weekly before Griffin's apology, Shields, the photographer, said that he and the comedian had discussed doing something. She told him: "I'm not afraid to get political if you want or make a statement if you want." Shields added: "Fortunately, we have freedom of speech and all art is generally protected by these things, but again, this was her first thought, 'Will you bail me out of jail?' You know, again, it wasn't, 'I don't want to do this because I might go to jail.' It was like, 'Well, I'm gonna do it and whatever happens, happens.'" Regarding potential backlash, he said: "It's this thing of, 'Well, I want everyone to like me. I want everyone to like the work that I make, especially young artists.' You want people to love you, but part of that is that if you make things that are polarizing, people are gonna hate it. I think there will be a lot of people who will absolutely hate this, but again, that's the beauty of it. That's the fun of making things. "Am I saying that anyone should actually be killed? No, it's like a movie. How many movies are there where the president gets killed or this happens? Tons upon tons. But again, when it's an image, especially an image like this, people don't see it like that. They see it as reality and that's why it's so shocking to some people." The photographer told the New York Daily News that "when you make art, you can do anything you want." But Griffin said that ultimately she and Shields went too far. "I understand how it offends people. It wasn't funny - I get it," she said in her Tuesday night apology. "I've made a lot of mistakes in my career. I will continue. I ask your forgiveness. Taking down the image. Going to ask the photographer to take down the image. And I beg for your forgiveness. I went too far. I made a mistake and I was wrong." The Washington Post's Krissah Thompson contributed to this report.